front entrance of the Kinosaki Onsen hot springs. at a simple, heartwarming inn. 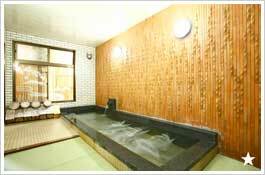 Our medicinal stone sauna and open-air baths for private bathing are tremendously popular. but at prices that are kind on the wallet. New event! The 22nd of every month is “Ducky Bath Time” Day! Some 200 rubber ducky toys float in the bath! You can also request to borrow 100 duckies at any time! How about enjoying this service for a child’s special occasion? 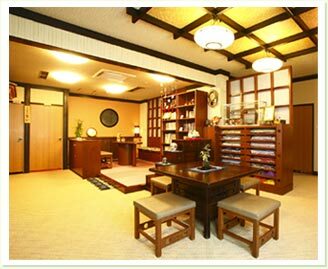 OYADO HANUSAN is a Japanese-style inn that comprises three buildings, with an annex and new building in addition to the main building. The annex has five guest rooms with private open-air baths and one room with a Japanese umbrella pine bath. These rooms are recommended for guests who wish to take their time and relax in soothing comfort. Guests staying in the main building can also use the annex’s SESERAGI-NO-YU open-air bath, which overlooks a graceful Japanese-style garden recreating “Satoyama and Tanigawa”. We provide a variety of guest rooms, beginning with rooms boasting wonderful views overlooking the Maruyama River. All guest rooms provide a warm, soothing space in which to relax. 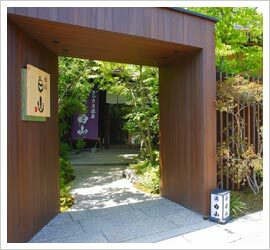 The inn’s wide range of facilities includes a “jet bath”, “stone bath with tatami-floored washing room”, “family baths for private bathing”, and “stone sauna”, and the annex also has the SESERAGI-NO-YU bath (times for alternate male/female bathing) at the entrance and indoor baths. the following five baths free-of-charge for their private bathing pleasure. 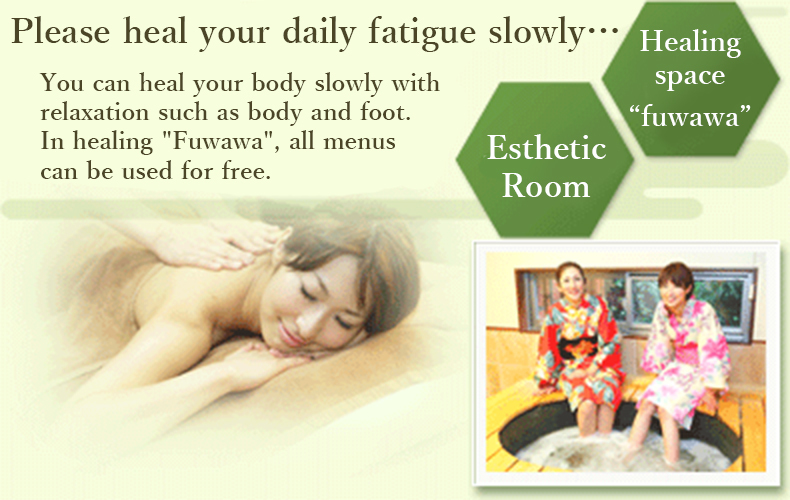 In the mornings, TAKEIZUMI-NO-YU is for male bathing, while NAGOMI-NO-YU is for female bathing. Nighttime reservations are free of charge. 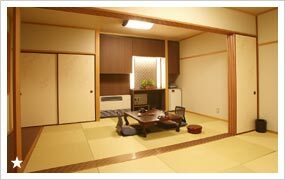 All washing rooms are tatami-matted and are especially popular with women and children. Made using minerals with medicinal effects, the medicinal stone sauna can be expected to increase the body’s metabolism and provide detoxifying and skin-beautifying effects. The sauna is highly popular as even couples who always want to be together can share the sauna companionably. Of course, you can also reserve the sauna for yourself for a luxurious experience. (including water and sauna clothes). Newly refurbished in the summer of 2006, the guest rooms exude a calming modern-Japanese-style atmosphere, filled with the still-new refreshing fragrance of the tatami mats. The inn’s main building has 17 guest rooms. Rooms on the Maruyama River side and rooms on the quiet mountain side of the building?either provide soothing spaces for relaxing. All rooms include bathrooms equipped with toilets with bidet functions. We also provide room meals services, enabling all guests to freely enjoy delicious meals in relaxed comfort. Please relax and savor delicious cuisine that changes with the season. 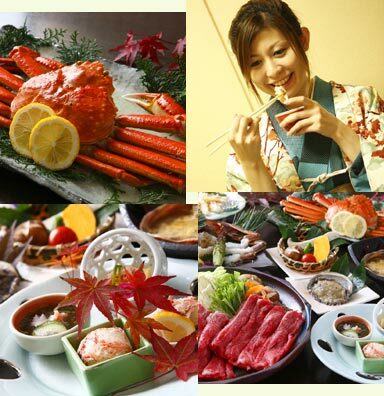 but less than “special occasion”…please relax and enjoy a casual holiday in Kinosaki with us.